So far, we created a simple application with custom business object “Bonus Plan” to save employee specific rules for bonus entitlement. Task: Create a second Custom Business Object to work with the existing one. Example: A Manager wants to create a “Bonus Entitlement” (= bonus calculation) based on sales volume that uses data of a bonus plan. I) Having completed all preceding parts of SAP S/4HANA Extensibility Tutorial. II) Having Sales Orders in the system for the employee of the bonus plan as creator. The sales Orders where created within the validity period of the bonus plan. Their sum of Net Amount should be higher than multiplication product of bonus plan’s Target Amount and High Bonus Assignment Factor. To be able to create Sales Order a user needs Business Catalog SAP_SD_BC_SO_PROC_MC. Create the second Business Object, named Bonus Entitlement. 1. Open the business object and “Go to Fields and Logic”. Hint: Bonus plan must be set. Hint: For the SELECT the bonus plan ID must me right aligned in the text field. You can achieve that with the help of length function strln() and the SHIFT statement. When calculating the number of places that the id shall be shifted right, bear in mind that the minuend, the id length has to be subtracted from is 19 not 20 (which would be the length of the id’s text field). length = strlen( bonusentitlement-bonusplanid ). SHIFT bonusplan_id BY ( 19 - length ) PLACES RIGHT. If the employee reached more than the multiplication product of Target Amount and High Bonus Assignment Factor, he gets the High Bonus Percentage of his revenue above that multiplication product as High Bonus Amount additionally to the Low Bonus Amount. Hint: If (ActualRevenueAmount / TargetAmount) > HighBonusAssignmentFactor, then HighBonusAmount = (ActualRevenueAmount – (TargetAmount * HighBonusAssignmentFactor)) * HighBonusPercentage. IF ( bonusentitlement-actualrevenueamount_v / bonusplan-targetamount_v ) GT bonusplan-lowbonusassignmentfactor. bonusentitlement-lowbonusamount_v = bonusentitlement-actualrevenueamount_v * bonusplan-lowbonuspercentage / 100. IF ( bonusentitlement-actualrevenueamount_v / bonusplan-targetamount_v ) GT bonusplan-highbonusassignmentfactor. bonusentitlement-highbonusamount_v = ( bonusentitlement-actualrevenueamount_v - ( bonusplan-targetamount_v * bonusplan-highbonusassignmentfactor ) ) *  bonusplan-highbonuspercentage / 100. Sum the different bonuses to the Total one. bonusentitlement-totalbonusamount_v = bonusentitlement-lowbonusamount_v + bonusentitlement-highbonusamount_v. DATA(actrevenue_s) = CONV string( bonusentitlement-actualrevenueamount_v ). DATA(target_s) = CONV string( bonusplan-targetamount_v ). DATA(lowf_s) = CONV string( bonusplan-lowbonusassignmentfactor ). DATA(lowp_s) = CONV string( bonusplan-lowbonuspercentage ). DATA(highf_s) = CONV string( bonusplan-highbonusassignmentfactor ). DATA(highp_s) = CONV string( bonusplan-highbonuspercentage ). ', High Percentage: ' highp_s INTO bonusentitlement-description SEPARATED BY space. 6. Implement a check that the Bonus entitlement is unique, which means the only one for the associated bonus plan. message = 'No Bonus Plan set. Bonus calculation impossible.'. CONCATENATE 'Bonus Entitlement for Bonus Plan ' bonusentitlement-bonusplanid 'already exists' INTO message SEPARATED BY SPACE. CONCATENATE 'Bonus Plan ' bonusentitlement-bonusplanid 'does not exist. Bonus calculation impossible.' INTO message SEPARATED BY SPACE. CONCATENATE 'Bonus Plan ' bonusentitlement-bonusplanid 'is not released. Bonus calculation not allowed yet.' INTO message SEPARATED BY SPACE. message = 'Bonus calculated' . 1. Open the Bonus Entitlement in Custom Business Objects application. 2. Start edit mode by executing the “Edit Draft” action. 2. Check the two boxes for UI Generation and Service Generation. 3. Publish the business object to trigger the generation of UIs (Master and Detail) and OData Service. 4. Go to Custom Catalog Extension application by clicking the “Maintain Catalogs” action. 5. Start adding a catalog with the “Add” action. 6. 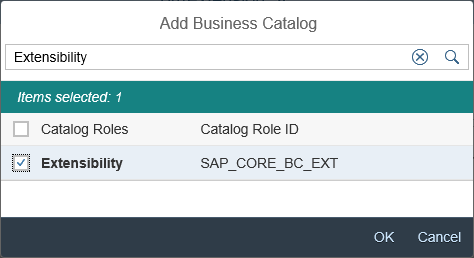 In the opening value help narrow down the result list by searching for “Extensibility”, select the Catalog with role ID “SAP_CORE_BC_EXT” and press “OK”. 7. Select the just added Catalog and publish it. 8. Back in the Custom Business Object application’s window, go to the SAP Fiori Launchpad via Home action. 9. Refresh the Browser window with key F5 for that the catalog extension becomes visible. 10. Open the application by clicking its tile. 1. Open the Bonus Entitlement application. 4. Save the Bonus Entitlement. All Data of the Entitlement will get filled.